On Thursday, 31 January, the STCC represented by its president Bruno Odermatt and selected Board Members, met a delegation of the Swiss Student Alumni Association (SSAA), headed by Khun Koblarb Poshakrishna, president of this venerable institution. The Swiss Students Alumni Association under the Royal Patronage of HRH Princess Kalyani Vadhana Krom Luang Naradhiwas Rajanagarindra was established in 1948 with an objective to organize charity activities for public interest to be beneficial to various organizations. As part of the STCC 20th anniversary Corporate Social Responsibility projects, the Board of Directors allocated 50,000 THB to support a vocational education scholarships for underprivileged students. 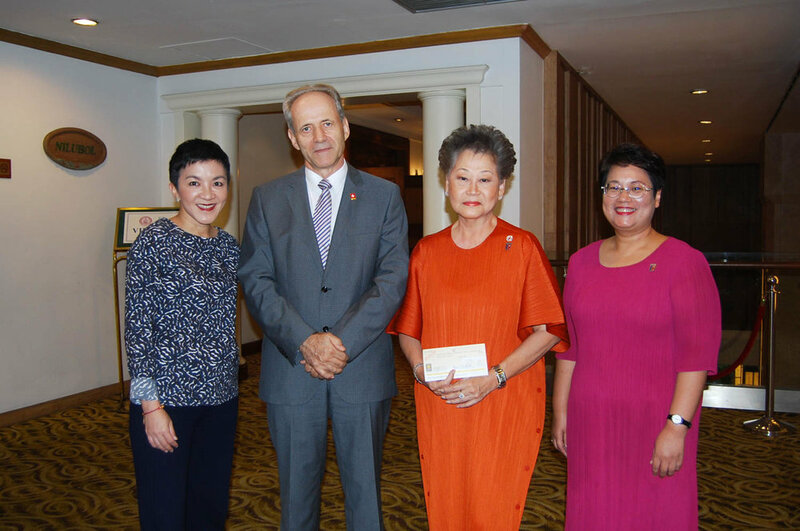 The Vocational Education Scholarships for Underprivileged Students to Support Sustainable Rural Development Project was initiated in 2015 to celebrate the 60th anniversary of HRH Princess Maha Chakri Sirindhorn who has been supporting the SSAA’s activities throughout these years and is a strong advocate of education development. The STCC shares the rural development philosophy of SSAA, that vocational education is essential because it provides the fundamental basic skills for people to progress and succeed in their careers. More importantly, vocational graduates have greater chances to start their career or businesses in their hometown and make sound contribution to rural development. With an opportunity to study and be trained in Switzerland, which is globally recognized for high quality vocational education, Thai vocational students can learn and develop more knowledge, skills and wider perspective of international practice as well as different culture. The vocational students have the opportunity to gain practical knowledge by working at world class partner companies, such as Nestle and Omega, and once they return to Thailand, they will be able to support self-development and community development in their home towns. Through this donation the STCC lends support to the efforts of the SSAA, who is responsible for the personal expenses of the scholarship awardees. Such expenses would include, for example the fee for foreign language lessons to prepare students for necessary skills required for their training and work experience program, travel expenses, accommodation, health and accident insurance, text books and learning equipment. The STCC is proud to be supporter of this programme and hopes that the vocational students will be an inspiration for other young people to follow their path and drive the efforts to build a better society in Thailand. Older Post20th Anniversary STCC Donation to Moo Baan Dek.